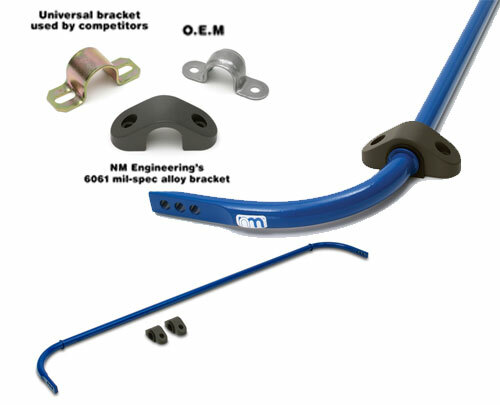 NM Engineering’s 22mm Solid Rear Sway Bar is guaranteed to make your MINI more go-kart-like. With additional rear roll stiffness and 5-position adjustability, installation of the bar produces significantly more neutral handling characteristics. Included are new aerospace-spec 7075 CNC machined, hard anodized bushing brackets for added durability. The billet brackets also feature grease fittings which allows users to grease the bushings with ease. Low resistance, graphite impregnated urethane bushings as well as machined ends and glossy powder coat bar round out the package. Notes: Powder Coated NM Blue. This system includes the newly redesigned bracket kit which can be purchased separately if users choose to update the superseded version.